I have to admit when I first heard this track I thought it was a new song from MGMT or Passion Pit. 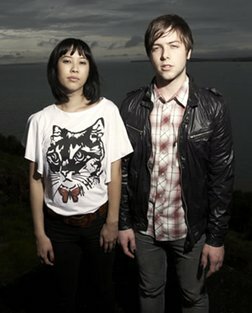 But I was pleasantly surprised to find out it was the latest single from Kiwi indie darlings The Naked and Famous. I first heard of them at the end of 2008, however I moved overseas for a period and almost forgot about them until I heard this track a few months ago on an indie radio station here. This is definitely going to be the biggest tune to come out of New Zealand this year, a perfect summer anthem for all you lucky people enjoying the warm sunshine in the Northern Hemisphere. This is their latest single Young Blood off their forthcoming debut album coming out later this year.